It's been too long since I've been able to cover a college tournament and I couldn't have picked a better one to be at than the ITA National Men's Indoors, at Chicago's Midtown Tennis Club. Georgia dropped one point to Florida State (14), while No. 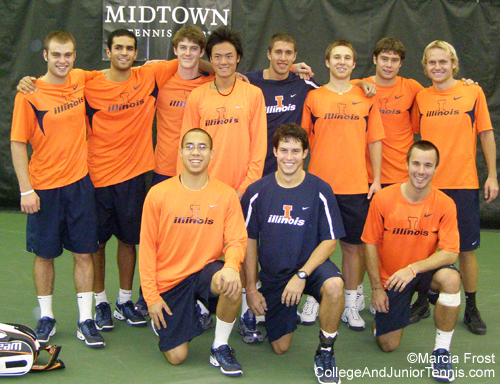 13 Illinois won the doubles point and held UCLA (4) close before falling, 4-2. Major changes came on Day Two as three of the top four seeds fell -- all in tight matches. It was Tennessee who took down the No. 1 seeds, with the Buckeyes falling in the final match when Matteo Fago defeated Balazs Novak, 6-3,7-5, ending their bid at their first national title. On the other hand, it's hard to really call Virginia's 4-3 win over the UCLA team an "upset" considering they were defending champions and ranked only one below, but it did take out No. 4. 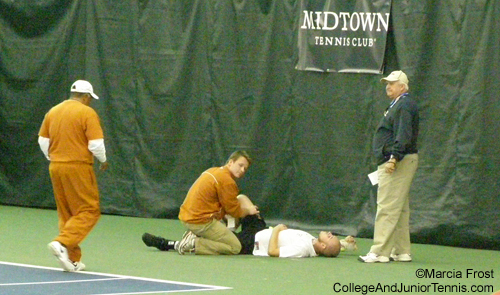 The big excitement of the day, however was the Stanford-Texas match. It was close all along and the final judgment came in the third set of the final match. It was unfortunate, though, that Bradley Klahn (left) had to take the win from a cramping Kellen Damico, who had been serving for it at 6-5, though I feel he did it with appropriate sportsmanship. I'm sure the crowd (and Kellen) would have been happier had he been able to play it out. Semifinal Sunday began with Stanford vs. Georgia (the Bulldogs had eliminated Southern California 4-2 in the previous round). While the Cardinals showed that they are heading back into the contention of years past, they weren't enough for the winners of the last two NCAA Championships and fell 4-2. The Tennessee-Virginia semi was less eventful with the defending champion Caveliers shutting out the Volunteers. Despite falling in the first round, the hometown advantage did ring true for the Fighting Illini as the supporting crowds helped the No. 13 team earn upsets against Tulsa (12) and Baylor (10) in the backdraw. Especially impressive was senior Marc Spicijaric, whose 7-1 record for the weekend included his straight set defeat of the Bears' Jordan Rux, ranked No. 13 in the country. Heading into the final the University of Virginia was 59-2 since March of 2007, with their last loss coming to Georgia at the NCAAs in a 4-3 semifinal contest. They were the defending champions, but Georgia was the winner of this event in 2006 and 2007, when it was held at this same location. For this season, both teams were coming in undefeated. There was no doubt I was in for a great final. it at No. 2 for Virginia, both other matches went into simultaneous tiebreakers. It was the match at No. 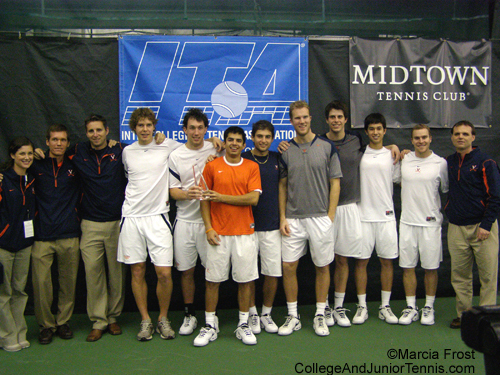 1 that would finish first as Houston Barrick & Sanam Singh claimed the breaker and the doubles point for Virginia. It seemed like barely no time at all that Houston was claiming the Cavaliers first singles victory, as he defeated Georgia's Borja Malo, 6-4,6-0. 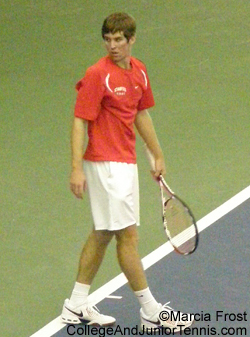 The lone Georgia point came from Nate Schnugg, with a win over Dominic Inglot. Steven Rooda brought Virginia one step closer as he beat Drake Bernstein, but the final point would not come so easy. The final score may have been 4-1, but there was no lack of excitement in the final. It was an incredible display of doubles that started it off. After Michael Shabaz & Dominic Inglot took Virginia was up 3-1 over Georgia with three matches remaining on court. The second and sixth singles were tied at 5-5, with No. 6 in a third set. The No. 3 singles was at 4-4, also in a third. It was anyone's guess who would clinch this (at it was still a possibility that Georgia could pull it out). With the courts in different areas, it was impossible to see them all and I made my choice to stay with Drew Courtney-Josh Varela at No. 6. It proved to be the right place to be as I witnessed some spectacular points before Drew (right) took it for the team, 7-5 in the third. 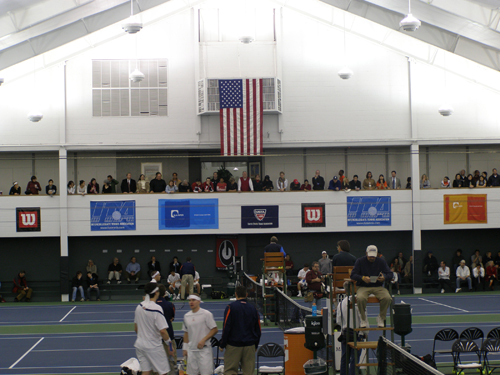 The ITA Indoors came together with the hard work of many people at the Midtown Tennis Club and the University of Illinois who worked long hours. 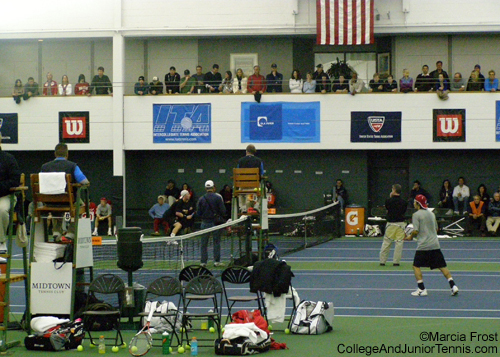 Their effort was clear to the hundreds of spectators who came for a great weekend of college tennis. 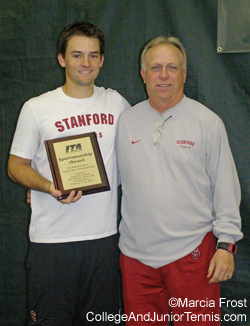 The ITA Sportsmanship Award went to Stanford's Alex Clayton (pictured left with Coach John Whitlinger). For more stories and photos, also visit Zoo Tennis and Chicago Sporting. 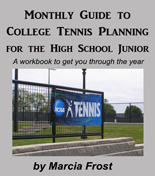 For full results, visit the official websites of the ITA and University of Illinois.